By Daren Mueller, Iowa State University; Damon Smith, University of Wisconsin-Madison; Shawn Conley, University of Wisconsin-Madison; Spyridon Mourtzinis, University of Wisconsin-Madison;Yuba Kandel, Iowa State University; Tom Allen, Mississippi State University; Terry Spurlock, University of Arkansas; and Travis Faske, University of Arkansas. Selecting the most appropriate soybean varieties each year is critical for farming operations to remain profitable. Although your top factor is often high yield potential, there are other characteristics you should consider. These other characteristics include disease-, insect-, and herbicide-resistance traits; maturity date; and target market. If you focus on only one of these aspects during the selection process it can leave your farming operation vulnerable to economic losses from the other issues. The variety selection process can become complicated if a given variety doesn’t include the traits you want. For example, when the Roundup Ready®(RR) trait was first made commercially available over 20 years ago, some farmers selected varieties with the RR trait primarily for weed control, but they experienced yield loss from an increased incidence of sudden death syndrome (caused by Fusarium virguliforme) (Sanogo et al. 2000). Eventually, subsequent variety releases corrected this problem, but it illustrates an important lesson about immediately adopting new agricultural products. The recent introduction of soybean varieties that contain stacked herbicide trait technologies (glyphosate and dicamba resistance) address important resistant-weed management issues. However, recent research shows that these technologies, commercially available as Roundup Ready 2 Xtend®(RR2X), may lack genes (that were present in RR varieties) that made them resistant to regionally important stem diseases. Therefore, RR2X varieties are not currently suitable for all field situations. Below, we take a closer look at some factors you should consider when evaluating RR2X soybean varieties. In 2017, plant pathologists across the United States evaluated RR2X soybean varieties for resistance to major disease-causing stem pathogens. 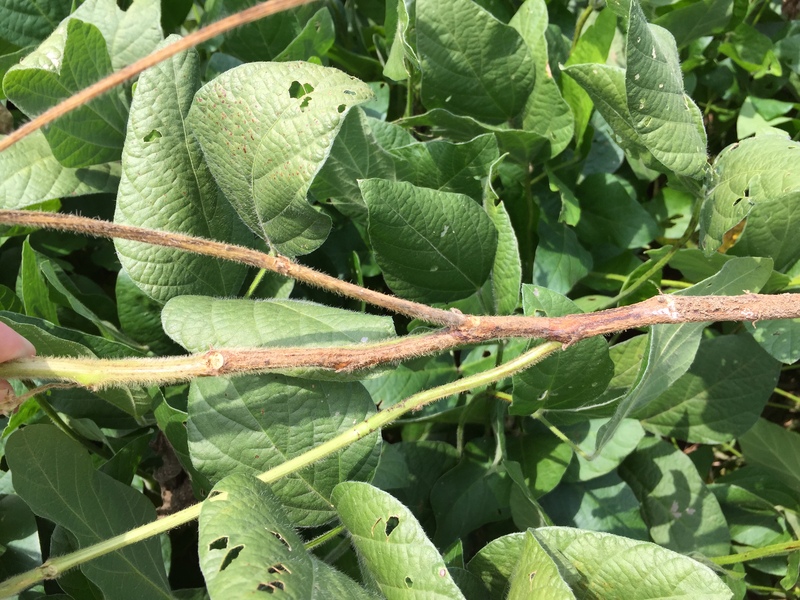 In Wisconsin, researchers evaluated 219 soybean varieties, including 124 RR2X and 95 Roundup Ready 2 Yield® (RR2Y) varieties at three locations that had white mold (caused by Sclerotinia sclerotiorum) (Figure 1). 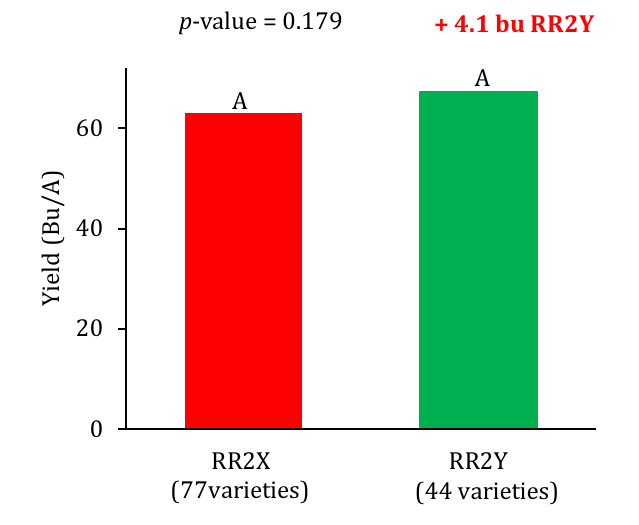 In an effort to tease out the general level of resistance to white mold in RR2X varieties that spanned the maturity groups appropriate to the upper Midwest, the researchers conducted a comparative analysis against RR2Y varieties that spanned the same maturity group range. This “global analysis” allowed researchers to use the power of a large data set to capture the general white mold resistance level in RR2X varieties using RR2Y varieties as an industry standard comparison. 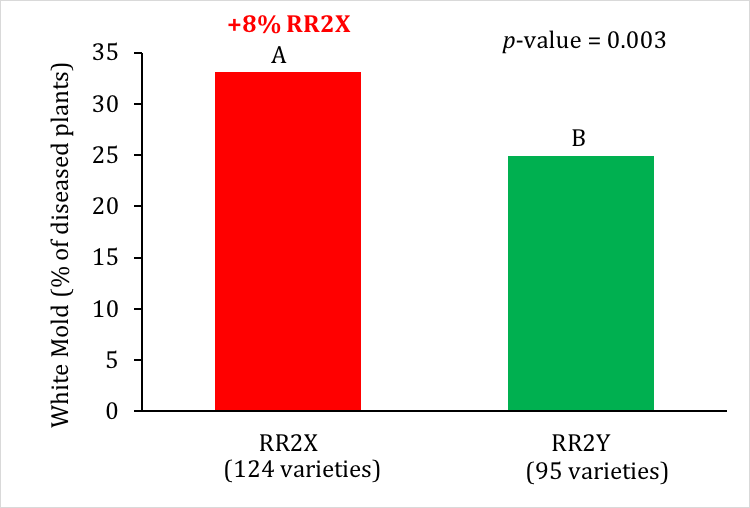 On average, RR2X varieties had significantly more disease and had lower yields than RR2Y varieties when all other factors were considered generally equal (Figures 2 and 3). This indicates an increased risk when planting RR2X varieties in fields with a history of white mold. Figure 1.This photo shows signs and symptoms of white mold (caused by Sclerotinia sclerotiorum) on soybean. Planting Roundup Ready 2 Xtend® (RR2X) varieties into fields with a history of this disease increases risk of disease and associated yield loss. Photo by Daren Mueller, Iowa State University. Figure 2.This graph shows the average white mold incidence of Roundup Ready 2 Xtend® (RR2X) and Roundup Ready 2 Yield® (RR2Y) soybean varieties averaged over three Wisconsin locations in 2017 where white mold (caused by Sclerotinia sclerotiorum) was the major yield-limiting factor. The P-value tested the null hypothesis that there was no statistical difference between the two groups of varieties based on t-test. The different letters on the bars indicate they were statistically different at α = 0.05. Figure 3.This graph shows the average yield of Roundup Ready 2 Xtend® (RR2X) and Roundup Ready 2 Yield® (RR2Y) soybean varieties averaged over three Wisconsin locations in 2017 where white mold (caused by Sclerotinia sclerotiorum) was the major yield-limiting factor. The P-value tested the null hypothesis that there was no statistical difference between the two groups of varieties based on t-test. The different letters on the bars indicate they were statistically different at α = 0.05. [/caption] Researchers in Mississippi and Arkansas also evaluated a total of 189 soybean varieties for resistance to southern stem canker (caused by Diaporthe aspalathi) (Figure 4). The varieties represented entries from maturity groups IV and V designated as either early (4.0-4.6 and 5.0-5.6) or late (4.7-4.9 and 5.7-5.9) based on relative maturities within each group. The evaluation included 117 RR2X and 72 RR2Y varieties. The researchers used natural infection and artificial disease inoculation methods (flat toothpick inoculation). 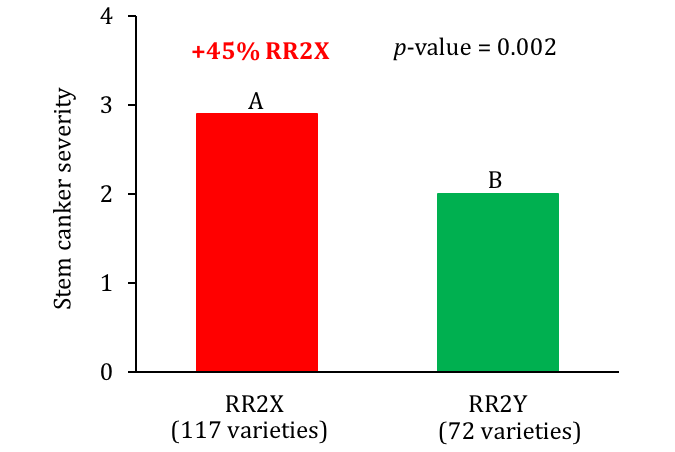 On average, RR2X varieties had greater disease than RR2Y varieties regardless of the specific situation at a given location (Figure 5). This indicates that planting RR2X varieties in fields with a history of southern stem canker are at increased risk. 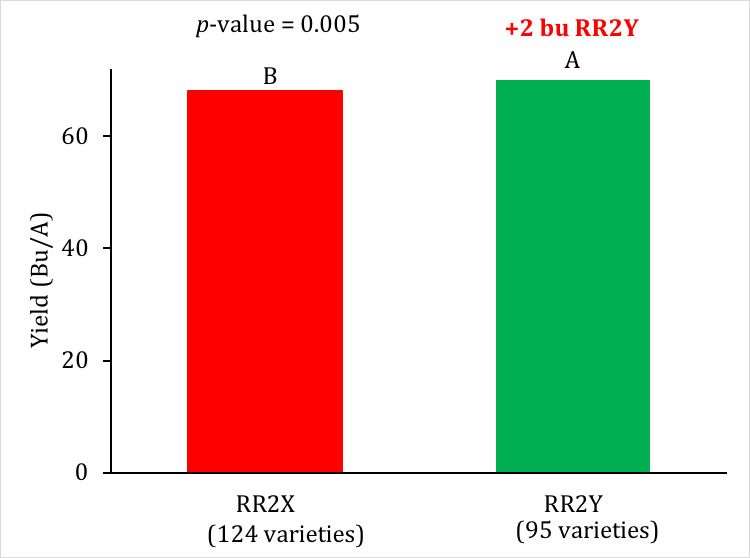 In naturally infected plots, yield differences were not statistically different between RR2X and RR2Y varieties (Figure 6). Figure 5.This graph shows the mean severity of southern stem canker (Diaporthe aspalathi) in Roundup Ready 2 Xtend® (RR2X) and Roundup Ready 2 Yield® (RR2Y) soybean varieties averaged across all maturity groups and relative maturities (MG IV early (n=52)/late (n=74) and MG V early (n=59)/late (n=4)) evaluated under natural disease pressure in Clarksdale, Mississippi, and using toothpick inoculation method in 2017 in Mississippi and Arkansas. In the naturally infected location, stem canker was observed as the amount of each plot exhibiting stem lesions on the main stem and severity of interveinal chlorosis or defoliation at the time of observation based on a scale of 0-9 where 0 = no plants in the plot to 9 = severe stem lesions and complete defoliation. In the toothpick-inoculated locations (AR and MS), the response to inoculation was evaluated on a scale of 0-9 where 0 = no lesion on the stem, 5 = moderate lesion, and 9 = severe lesion expansion and a dead plant. The P-value tested the null hypothesis that there was no statistical difference between the two groups of varieties based on t-test. The different letters on the bars indicate they were statistically different at α = 0.05. Figure 6.This graph shows the mean soybean yield (Bu/A) of Roundup Ready 2 Xtend® (RR2X) and Roundup Ready 2 Yield® (RR2Y) soybean varieties averaged across all maturity groups and relative maturities (MG IV early (n=35)/late (n=46) and MG V early (n=36)/late (n=4)). Southern stem canker (Diaporthe aspalathi) occurred under natural disease conditions in Clarksdale, Mississippi, in 2017. The P-value tested the null hypothesis that there was no statistical difference between the two groups of varieties based on t-test. The same letters on the bars indicate they were not statistically different at α = 0.05. [/caption] Conclusion Choosing soybean varieties can be a balancing act that is driven by competing priorities. If you let any single priority take precedence over all other aspects, it can introduce unintended risks to your farming operation. In addition to emphasizing yield, farmers should consider the most yield-limiting problems in their fields, including weeds, diseases, and insects. Finally, all varieties should stand on their own. It is important to remember that not all RR2X soybean varieties are created equal. Be sure to evaluate the varieties you would like to plant to determine if their disease resistance potential is great enough for your field. Moreover, it is important to consider unbiased research observations when considering the response of varieties to diseases of regional importance. More information For general information on soybean variety selection, see Considerations for Selecting Soybean Varieties (CPN 4004). 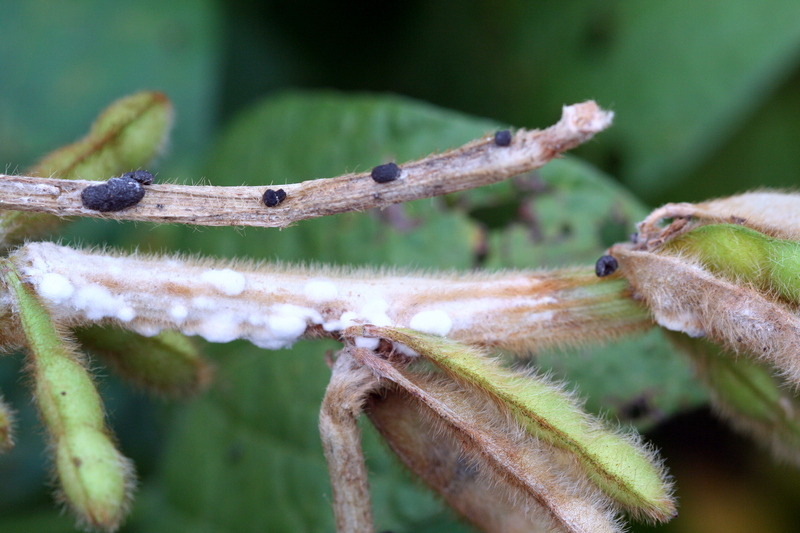 To learn more about managing white mold, see Soybean Disease Management: White Mold (CPN-1005). To learn more about managing stem canker, see Soybean Disease Management: Stem Canker (CPN-1006). Reference Sanogo, S., Yang, X. B., and Scherm, H. 2000. Effects of herbicides on Fusarium solani f. sp. glycines and development of sudden death syndrome in glyphosate-tolerant soybean. Phytopathology 90:57-66.